Whilst scar formation is essential to the healing process after a cut or wound, even after surgery or trauma. Some scars can become hard and non-pliable, they may cause contractures of the tissue which limits range of movement. Some can impede mobility and function. They can also become painful, as nerves and tissues are bound up with that scar formation. The quality and appearance of scars vary widely depending on the individual's healing process; amount of tension placed on the scar and position of the scar. 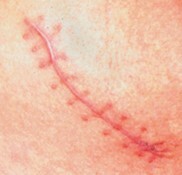 Scar work is a Method developed in US by Sharon Wheeler, a Rolfer. Scar Work is a the name given to this method by UK MAssage Therapist Emmal Holly, and is followed by a small number of therapists across the UK, USA and now Australia. Lynette Guy is one of the only therapists in Australia with this training, which she completed in UK in 2014. Before Scar Work - image across the shoulder/neck. The type and degree of scar formation varies from one person to another. The extent to which this concerns the individual, causes them pain or disability also varies. Not all people are worried about their scars - but others are. Scars can be depressing, even distressing for some. All types of scars may benefit from scar work. This includes scars that form after cardiac surgery, orthopaedic or neurological type of surgery. It is best to wait till at least 4-6 weeks post surgery till the initial healing period has been completed. Scars such as post Caesarian can also benefit - particularly because the abdominal muscles can get bound up in the scar formation and impact on the ability to get back former strength and muscle tone after the baby is born. After Scar Work - same scar as shown on the left. 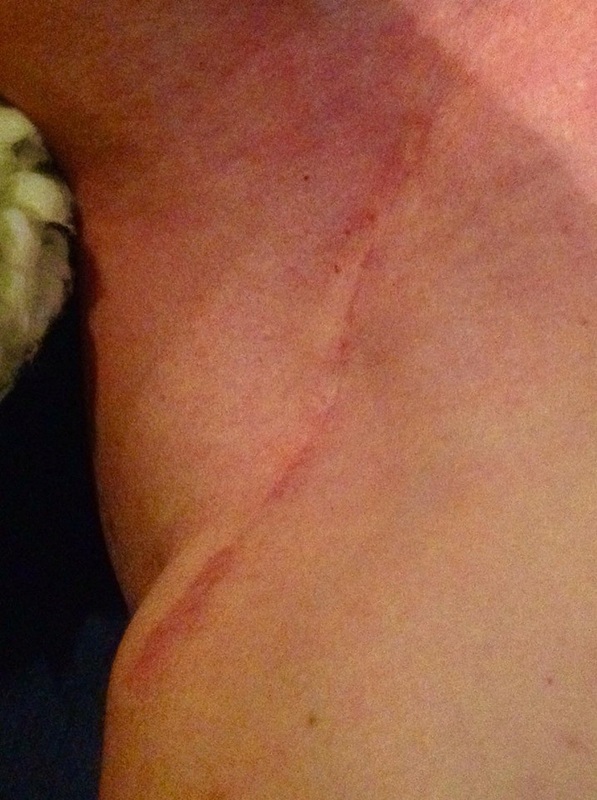 This is the view of the scar shown in the picture on the left - after having scar work on it. Different techniques are applied to the scar and the tissues surrounding the area, and varied according to the findings of each individual. Scar work is not painful. It is very gentle, and involves soft tissue techniques that works on changing the fascia and collagen fibres that have altered after the surgery or injury. Whilst each person will see changes in their tissues after each session, the degree of change is difficult to predict. For some, the most important changes might be the restoration of feeling - it is common to have ongoing numbness around scar formation, as the fascia tightens and may compress local sensory nerves. For others there may be an emotional response to their scars being touched and worked on. This is particularly so after breast cancer or abdominal surgeries. This response is normal, and a response may persist for a day or so. Contra-indications: Where there is ongoing infection or the wound has not yet healed over, then scar work is not recommended. Please consult your doctor if you have any concerns about your wounds or scar tissue. - Lynette Guy, Physiotherapist.